Written by Mr. Frank Pinkston, Military and civilian employee of the Air Force Security Service and the National Security Agency from 1951 to retirement in 1985. There is a very interesting and little known fact about General Blake’s involvement in the ending of the war with the Japanese in 1945. He was the first American to set foot on Japanese soil after the surrender. I can tell you what I know about this story from many personal discussions I had with General Blake and from what I read doing research for him in the Air Force archives at the Air University, Maxwell Air Force base in Alabama. But first, I need to explain a little about my background and how I came to have a personal relationship with General Blake. I came to work for NSA as a civilian in the mid 1950s. I was married to an Irish ballerina from Cape Town, South Africa who I met in England where she was dancing with the, now known as, Royal Academy of Ballet Company. We were married in Tripoli, Libya and served there for a three year tour with the Air Force Security Service unit. Our return to Washington was her first time in the United States. Being a European professional ballerina and tap dancer, she became very interested in various types of dancing in the US. She especially liked square dancing and found it to be great fun. We became so involved in square dancing that I helped to establish a square dance club at NSA. This is where General Blake comes into the picture. Shortly after General Blake arrived at NSA, the newly formed square dance club advertised a special open house for new members at a dance on Fort Meade. Much to our surprise one of the first to arrive was General Blake and his wife Ruth dressed in fashionable square dance attire. This was the beginning of a very long and interesting social relationship with the Blake’s. As our acquaintance continued and grew through the many square dance events we attended, I learned more and more about his fascinating military career. He was a highly decorated B-29 pilot and an accomplished communications officer. I often encourage General Blake to write a book on his military experience, particularly on his involvement in the war with Japan. While I was at the Air War College in 1965-1966, I received a letter from General Blake asking me to go to the Air Force archives there and search for Air Force unit histories on certain units and for time periods that covered his service. I was very happy to hear that he was going to start writing his book. From this research I learned a lot more about his military career and involvement in the ending of the war with Japan. I visited with General Blake a number of times in San Antonio after his retirement, and I always asked how his book was coming along. He would show me that he had started, but was too busy on other things to spend much time on it. Unfortunately, the book was never finished. I cannot begin to cover the story of his entire fascinating and accomplished military career, but I will try my best to cover the part he played in the ending of the Japanese war, as I understand and remember the facts. Prior to the surrender by the Japanese on the U.S.S. Missouri on September 2, 1945, General MacArthur and other US officials became concerned about how they would be received in Japan. Due to circumstances of the surrender, there was fear that the surrender might not stand. A decision was made to send in one aircraft that would report back to General MacArthur as to the reception they received. The aircraft selected for the mission was a B-29 that had been equipped with all communications needed to report back to General MacArthur’s headquarters. Because of his record as a B-29 pilot and extensive communications experience, General (then Col) Blake was selected to head up the mission. On August 20, 1945, prior to the surrender, the B-29, with Col Blake as pilot, was launched with a destination of Ita Suki, Japan. Upon landing Col Blake and crew were very happy about the warm and friendly welcome they received. The welcoming party was headed up by one Japanese official that became good friends with Col Blake. The good news was reported back to General Mac Arthur and the initial cadre of occupying forces was launched. There is one other interesting point related to the man (I wish I could remember his name) who welcomed Col Blake when he landed in Japan in 1945. Years later, while General Blake was Director of NSA, he was making an official trip to the Orient and wanted to try to find this man who was so kind to him when he landed at Ita Suki. He had some people at the Agency conduct a search for him. They located him and he was still alive. Arrangements were made for General Blake to meet with him in Japan. They were both very excited to see each other and spend time talking about their experience in the war. I wish I could elaborate more on the details of this very important event associated with the surrender of the war with Japan, but my association with General Blake ended some time ago and at my age my memory is fading. I do know that General Blake had three sons, all who graduated from military academies – one from West Point, one from the Naval Academy, and one from the Air Force Academy. One of them may have a more complete story of this event. Among General Blake's many significant cryptologic assignments, as a Major, AAF, Blake was the operations officer at Hickham during the Pearl Harbor attack, and as Lt. Gen., he was the fourth Director, NSA (having been Commander USAFSS a few years previously). He became Director, NSA in 1962, arriving three months before Cuban Missile Crisis. 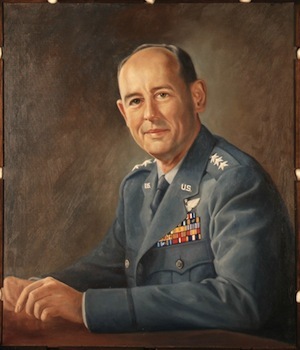 Portrait of General Blake is from the NSA 50th Anniversary Timeline Photos.